When it comes to reversing autoimmune disease, most of us focus on diet first and lifestyle second. Sometimes we're just pacing ourselves, and we can only handle one change at a time. Sometimes our autoimmune symptoms interfere with our ability to sleep, and we need to start feeling better before we are capable of sleeping more. But at some point in our healing journey, sleep needs to become our focus. It is directly connected to inflammation, autoimmune expression, hormone balance, brain function, mental health, cardiovascular health, and weight management. Autoimmune disease often involves problems in all of these areas. If we want to heal, sleep is absolutely essential. This makes sense if you think about. Our body repairs and rebuilds while we sleep. If we don't give it the time it needs to do this, how can we possibly reclaim our health? When my rheumatoid arthritis was at its worst, sleep was almost impossible, because lying down put pressure on my inflamed joints and was incredibly painful. I spent many nights trying to sleep in a Lazy-boy chair. As diet changes successfully began reducing my inflammation, I was able to sleep in bed. At first I needed bolsters and had to turn over frequently, but I felt grateful to be able to sleep at all. As my inflammation reduced even more, I was able to sleep comfortably. But guess what? I found myself slipping back into my old “night owl” habits: staying up later and later, getting less and less sleep, and trying to catch up on the weekends. Here's the thing – you actually can't “catch up.” Science shows that even though you may feel more rested after a night or two of longer sleep, your inflammatory genes stay activated. The way to turn off inflammation permanently is to get 7-10 hours of sleep every night, without exception. So, I gave myself a 30-day sleep challenge. I started with a bedtime and a waketime. That's the first step. You need to get on a schedule – our bodies like consistency. I set a timer to wind down an hour before my bedtime. I went to bed whether I was tired or not. And I got up at my waketime, whether I wanted to or not. Truth talk: It was hard at first! I was cranky about it; I didn't like making the change. It was hard to fall asleep at first, and I didn't like getting up early on the weekends. But then after a couple of weeks, something magical started to happen. I fell asleep more easily, I woke up feeling rested, and by the end of the month, my mood and my energy levels were higher, and my inflammation was lower. Sleep is a powerful thing! 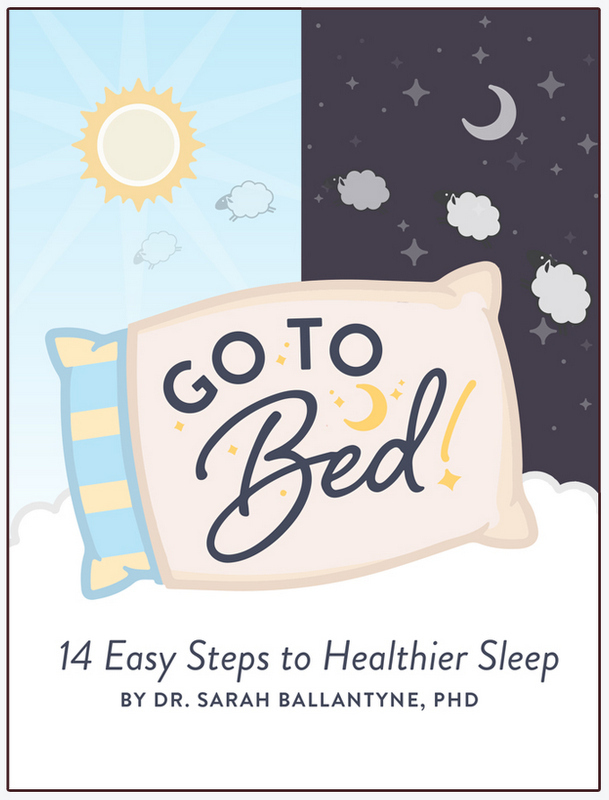 Sarah Ballantyne (aka The Paleo Mom) is the author of this e-book, and she chose to write it because sleep is a huge factor in her own Hashimoto's health. I interviewed her for my podcast: Beyond Food: Healing Lifestyle, where I asked people to talk about something that made a big difference in their healing that had nothing to do with food. Sarah said that 9 hours is her “sweet spot” for sleep, and if she gets less than that, her health plummets. Even knowing this, it's a challenge for her to prioritize, because she has children, a business, lots of goals, and there's limited time in the day. It's so easy to prioritize other things over sleep, yet when we do, we pay a huge price, especially if we have autoimmune disease. When Sarah sacrifices sleep, not only is she more likely to have an autoimmune flare, it's also harder for her to make healthy choices in general. When she's tired, she craves unhealthy foods and finds stress much harder to manage. Can you relate? It's all interconnected. So, what does she do? She makes a commitment to her own sleep. 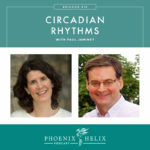 She follows the steps outlined in this e-book to entrain her circadian rhythms, which makes it easier to fall asleep at night, sleep deeply, and wake up feeling refreshed in the morning. In terms of time management, she gave up watching TV and strictly limits social media. While we often think our lives are too busy to sleep, most of us spend a surprising amount of time each day on these two things or something similar. Sleep is definitely more important than TV. Do you have to set an alarm in the morning? Would you sleep past your alarm time if you didn’t have one set? Do you drag yourself out of bed? Or need caffeine in the morning to get going? Do you always sleep in on the weekends? 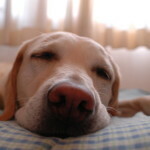 Do you get less than the minimum 7 hours sleep per night even once or twice per week? These are questions from the e-book, Go To Bed. If you answered yes to any of them, it's time to reverse your sleep debt and start prioritizing sleep for your health. 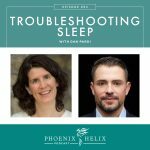 The Science Behind Sleep – If you're a fan of Sarah's work, you know she's a scientist by training and excels at research. This e-book explains in detail all of the ways sleep (or lack thereof) impacts your body and your health. It's all the information you need to motivate you for change. Detailed Advice for Improving Sleep – While the first step is to make a commitment to your sleep, it isn't always easy to get quality sleep. This e-book teaches you all the factors that influence sleep vs. insomnia. There are many steps you can take to start sleeping like a pro. A Guided 14-Day Challenge – One of my philosophies is that “baby steps still get you there.” Establishing a healthy sleep pattern, including the lifestyle changes necessary to support it, is a lot of change. It can be overwhelming to try to do it all at once. This e-book gives you just one task a day, and each one builds on the day before. By the end of two weeks, you will hopefully be sleeping more soundly, and enjoying the changes you've made to your routine. There are two ways to do this challenge. You can start any time you want, and there's even a link in the e-book to sign up for daily emails with tips and reminders to support you. You can also join the online group challenge that starts on the first Sunday of every month. The e-book includes links to Facebook groups you can join for peer support from others going through the challenge with you. This month's challenge starts Sunday, April 3, 2016 and I'll be sharing a daily sleep tip on my Facebook page each of those 14 days. 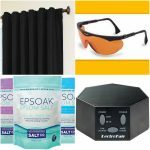 Practical Tips, Advanced Tips, and Answering the Question, “Why?” – If you follow my blog, you know I'm all about the practical. While I can geek out on the research, in the end I want to know how to implement it in my life. The 14-Day Challenge is very practical. It offers troubleshooting tips if you're struggling with implementing that day's task. There's an advanced challenge if the day's task is already part of your routine. And there's a “Why?” section that explains how that task improves sleep, which is perfect for a questioner like me. It Doesn't Stop on Day 15 – This is about making a lifestyle change. The 14-Day Challenge gets you started. The rest of the e-book provides with the information and resources to keep going. The winner was chosen with a random number generator on 4/15/2016. Congratulations to May! If you didn't win, don't despair. You can purchase your own copy of the ebook as well as the amber glasses I'm modeling in the photo below. Aren't I cute? 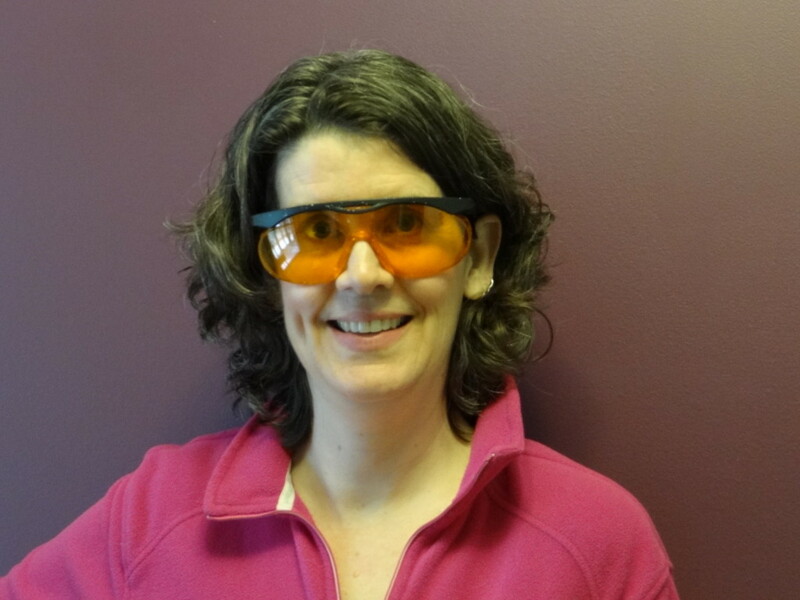 Amber glasses look funny – no question – but they're definitely trendy in the paleo community, because people know how important sleep is, and blocking blue light at night is a key to sleeping deeply. I'm giving away a pair of these glasses, along with Sarah's e-book: Go to Bed to one lucky winner, anywhere in the world. It's easy to enter. Just comment on this post below, telling me how much sleep you're getting each night right now. That’s it! If you want to subscribe to my blog or podcast, or follow me on social media, you’ll get all of my tips for autoimmune healing. But it’s not required at all. Since I love all my readers around the globe, this giveaway is open to anyone in the world. Good luck! The winner will be randomly chosen on April 15, 2016. And if you don’t want to wait, you can buy a copy of the e-book now and the glasses are sold through Amazon. Disclaimer: I was given a review copy of the e-book as well as a copy to give away, with no obligation. I’m 100% honest in my opinions. If I didn’t love it, I wouldn’t have written the review, nor hosted the giveaway. I'm putting my money where my mouth is by donating the amber glasses prize myself, and shipping them anywhere in the world the winner lives!